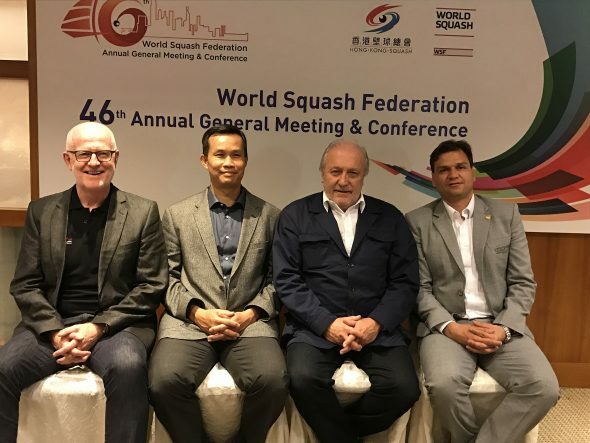 Also elected at the meeting were four new Vice Presidents: Gar Holohan, President of the Irish Federation; Pablo Serna, President of the Colombian Federation; Sarah Fitz-Gerald, the five-time World Champion and current World Over-45 Champion from Australia; and Huang Ying How, President of the Malaysian Federation. Fontaine, President of the French Squash Federation and European Regional Vice President as well as being a Board Member of the French National Olympic Committee, was elected ahead of three other candidates –Natalie Grainger, a former world number one from the USA who recently won the World Over-35 title; Egyptian Mohamed El Menshawy, a WSF Vice President for six years; and Zena Wooldridge, President of the European Squash Federation, from England. 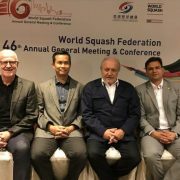 The incoming Board was delighted that squash legend Jahangir Khan agreed to serve a further term as Emeritus President of the WSF.